The new season of RESCUE ME opens with a harrowing vignette in which Tommy dies — and then things go downhill from there. All of which is a good thing. When last we saw Tommy Gavin (Denis Leary), he was lying in a pool of his own blood on the floor of the bar, bleeding out after being shot by a vengeful Uncle Teddy (Lenny Clarke). The story picked up with Tommy dying in the back of an ambulance, then jumped ahead to his recovery. Viewers got to experience Tommy’s vision along with him as his recent life flashed before his eyes; a ho-hum near-death experience. But that culminated in a tableau of body bags arrayed on the foggy ice of a hockey rink. One by one, the bags opened to reveal firefighters, and a confused Tommy found himself among the brave men who were killed on 9/11. Jimmy (James McCaffrey) was there, and encouraged Tommy to join him in the light with the others. But Tommy couldn’t; he suddenly found himself trapped in a burning tenement, hemmed in by flames. He was visited by the familiar ghosts of victims he could not save on 9/11, and tormented by a vision of the Twin Towers before the attack. And then he awoke, alive. Tommy was lucky to survive that blood-chilling near-death experience. I find so many such interludes to be utterly dull; this one was downright eerie. And I should expect nothing less from this brutal series, which is so loathe to pull punches. As the second season of MAKE IT OR BREAK IT began, Kaylie, Emily and Lauren were being marketed as the “rebel” faces of the Rock, Payson was back to practicing with her old fire, and Kim was once again managing (well, co-managing) the Rock with Summer. The girls of the “rebel Rock” were training the French invitationals, but the real hurdle to going to France was Eleanor Beals, from the NGO — who suspended them from the national team for competing against the Chinese in last season’s finale. The soapy content was sky-high, as Kaylie (Josie Loren) and Carter (Zachary Burr Abel) were not talking; because he has been creeping around with Lauren (Cassie Scerbo), unknown to the national champion. “Kaylie doesn’t always get everything,” Lauren sniffed. “I picked you because you were there for me.” Carter told Lauren. And even though he appreciated that she took him in, fed him and did his laundry, he noted, “You’re more competitive off the mats than on them.” When Kaylie confronted him at the Pizza Shack, he broke it off with her. Lauren worried about losing her best friend, but Carter noted, “She’s not your best friend if you’re lying to her! We both know that secrets hurt more than truth.” So Carter gave her a choice: her friendship with Kaylie, or her relationship with him. “Vincent and the Doctor” is, quite simply, a work of art that stands with the finest examples of DOCTOR WHO since the series returned in 2005. 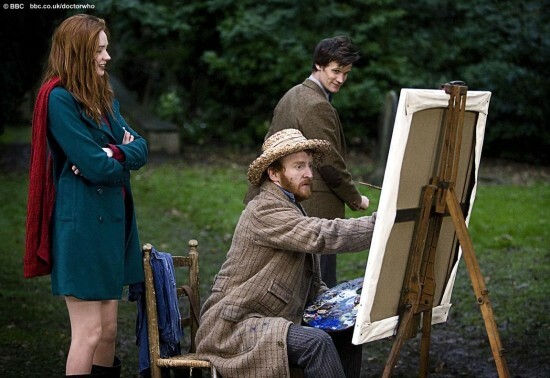 Like “The Time of Angels,” this story begins with the Doctor (Matt Smith) in a museum – this one the Musee d’Orsay in Paris – enjoying an exhibit of the work of Vincent van Gogh, where the Doctor notices some “very not right” about one particular painting. Church at Auvers featured a sinister face in one of the paintings. “I know evil when I see it,” the Doctor declared. “And I see it in that window.” So he and Amy (Karen Gillan) set off for 1890 to find out what happened. There, they find the revered artist was not held in high regard by his contemporaries. “He’s drunk, he’s mad, and he never pays his bills,” remarked a waitress at the local cafe (as depicted in Cafe Terrance at Night). Amy, however, totally lit up and even did a little dance when she saw the great painter. But van Gogh is having problems of his own: He sees a monster that no one else can – not even the Doctor! 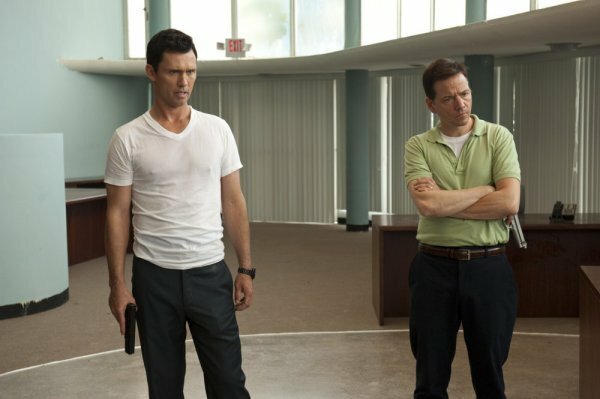 This week’s BURN NOTICE took a sort of “divide and conquer” tack, with Jesse and Fiona tracking down an address related to this season’s umbrella story, while Sam dragged Michael into the case of the week: taking hostages in a storefront office. Well, that wasn’t exactly what Sam (Bruce Campbell) had in mind when he talked Michael (Jeffrey Donovan) into helping out Josh Warren (guest star Frank Whaley), the administrator of a charity for police widows and orphans. Josh lost the fund’s money to a crooked financial manager, so Sam and Michael were meant to be muscle to scare Nick (Clayton Rohner) into giving back the money. But Josh foolishly brought along a gun, and somebody has read their Chekhov – if you show a gun in the first act, it has to be fired – so the situation quickly devolved into a hostage situation. Sam insisted on staying to help his pal, so there was no way Michael was going to leave without Sam. Apparently, it’s never too late for a major revelation about the Doctor’s Gallifreyan physiognomy on DOCTOR WHO. 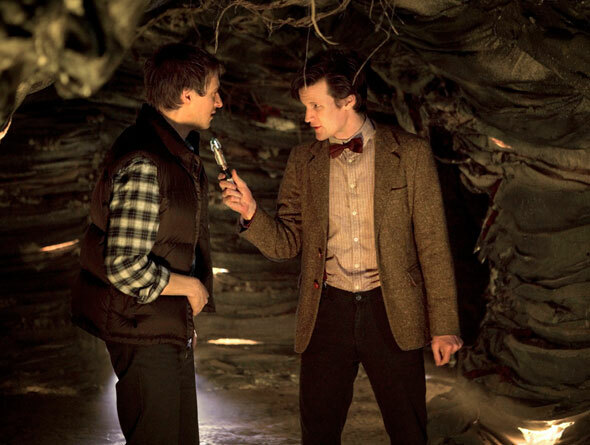 In the latest episode to air in the USA, “Cold Blood,” the Doctor (Matt Smith) was subjected to a decontamination process by the Silurian scientist Dr. Malokeh. The Time Lord writhed in pain as the procedure was explained to him. “Removal of human germs will remove half the things keeping me alive!” the Doctor cried. Really? Since when? Well…since now. I am not suggesting that it is impossible for the Doctor to require “germs” to keep him alive. We humans use lots of helpful bacteria in our bodies. And I assume that the Time Lord needs human germs in particular because he is, as the Eighth Doctor (Paul McGann) revealed in the 1996 TV movie, “I’m half-human on my mother’s side.” Further, the Master (Eric Roberts) echoes the assertion, stating, “The Doctor is half-human.” (The fact that he is a hybrid must account for why those germs are “half” the things keeping him alive.) The Doctor has undergone decontamination procedures before, but perhaps not processes designed to so specifically wipe out all “ape-based” germs. Indeed, the very word “germs” is often colloquial for “microscopic organisms” in general, though I would hardly expect a medical specialist like Dr. Malokeh to be so imprecise with scientific terminology. After last week’s somewhat less-than-thrilling part one ( “The Hungry Earth” felt underpopulated and underwritten), this week’s second part of the story, “Cold Blood,” delivered a cracking good DOCTOR WHO yarn, full of thrills, adventure, history, hopes dashed and (especially) heartbreak. 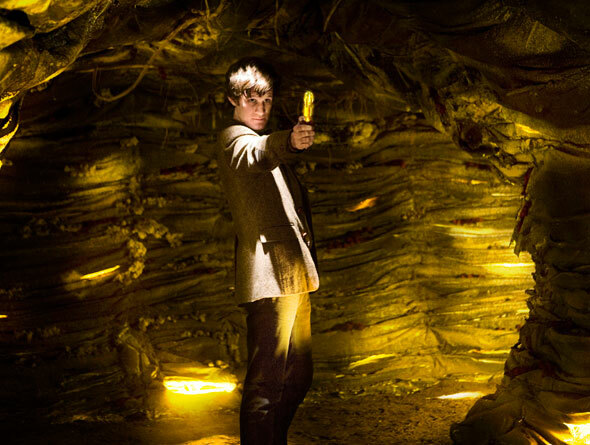 The story picked up with the Doctor (Matt Smith) and Nasreen (Meera Syal) entering the Silurian city to rescue the captive Amy (Karen Gillan), Mo and Elliot. But of course clever Amy was perfectly capable of rescuing herself, while the Doctor was perfectly capable of getting himself captured! In the science bay, the Doctor met the deceptively sympathetic Dr. Molokeh and the warlike Cmdr. Restac (since she was Alaya’s sister, actress Neve McIntosh essayed both roles). The military struggling with the science branch for control of the humans reminded me a lot of Planet of the Apes, with Dr. Zira pleading for Taylor’s life. Restac was just as blood-thirsty as any…er, “cold-blooded” human villain, and ordered the Doctor and the other “apes” executed. Luckily, Malokeh awoke Eldane, the leader of the Silurians, to intervene. He has a much more level head, and was willing to negotiate for shared control of the planet. 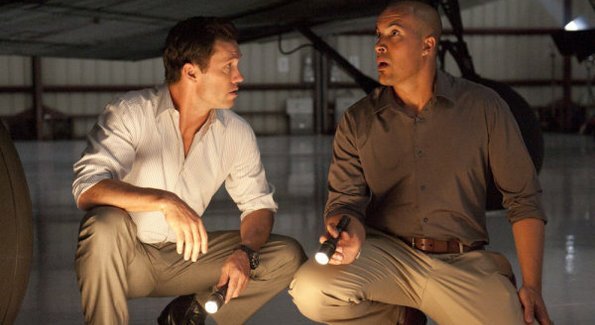 BURN NOTICE, while never in a slump, is actually experiencing a bit of a creative renaissance in its fourth season with the introduction of Jesse Porter, a counterintelligence officer who was burned by Michael. It’s a brilliant inversion of the series premise that has refreshed the case-of-the-week format. Michael (Jeffrey Donovan) accidentally burned Jesse (played by Colby Bell, whom some will remember as Officer Tyrone Davis on THIRD WATCH) at the end of the season premiere, when Michael used Jesse’s credentials to access secret files. Jesse is actually a lot like Michael used to be back when the series began: confused about what happened to him, but determined to get to the root of the problem, no matter where it takes him. The fun for the audience is, we know exactly where that quest will take him. Jesse has vowed to kill the man who burned him, so a reckoning is coming.